Do you want to create a competitive advantage in the market and/or stand out against competitors? If the answer is yes, this webinar is the perfect opportunity for you to learn more about the tools you can trust to answer the rising consumers’ demand for healthier materials. Dr. John McKeon, CEO of Allergy Standards, and Courtney Sunna, MBA, will give an insightful one hour course about why it is important to choose safer products and materials, and how to use Certified Products as a marketing platform to raise awareness and demand. The Webinar is organised by the GreenHome Institute and will be taking place on the 31st of January 2018, from 12pm to 1:15pm (EST time). The course will be online and is FREE! Asthma and allergy prevalence has doubled in America over the past 30 years, and is now a Top 5 Hazard to Human Health Worldwide. It is the leading cause of ER visits and school absenteeism among children, and contributes to rising healthcare costs by improper management of the indoor environment. Additionally, the US Environmental Protection Agency (EPA) estimates that we spend up to 90% of our time indoors, yet the US Federal Trade Commission (FTC), National Institutes of Health (NIH), and Food and Drug Administration (FDA) are all silent on the issues around the use of the word “hypoallergenic”. By reducing triggers and choosing healthier products, homeowners can optimize their indoor environment for health. This course will dive into the demand for transparency and healthier materials, with information about how building products can be tested, certified, and incorporated into projects. 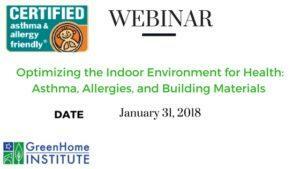 It will discuss the rigorousness of standard development and testing protocols and how Certified asthma & allergy friendly®® products contribute to healthier environments. How to use a combination of science and education to raise awareness and demand?